Figure 1: Still photo of M.2010.115.660. (LACMA, M.2010.115.660). Photograph by Yuriy Polyukhovych © 2016, courtesy of the Maya Hieroglyphic Database Project. How much is a pile of rabbits worth to a Maya god? This question seems to be answered by the text and image of a small painted cylindrical drinking cup, probably from the vicinity of Xultun, northeastern Peten, Guatemala, and now in the Los Angeles County Museum of Art (M.2010.115.660). [Figures 1 & 2] Recently, while studying this vessel in offsite storage, we were able to decipher most of its inscription, which conveys a portion of what must have been a widely dispersed myth during the Classic period of ancient Maya civilization (650-800 CE). The vessel features a dedication text painted around its rim, and a court scene featuring three figures wraps around its cylindrical surface. Seated on a dais, a lord sniffs a bouquet and gazes into the mirror propped before him. Facing him is a large man holding a peculiar looking long-necked bird, while behind the throne is a third figure—a hunchback. The figures may look human, but the text captions reveal that we are in fact looking at a mythic scene in which a bargain is about to be struck between gods. The caption above the pile of rabbits reads: "'There are many rabbits [but] not many wa’k’ ', said Juun Ajaw to Itzam Kokaaj.” This is an example of a quotation—akin to a speech balloon—that identifies the speaker as Juun Ajaw, the Classic period equivalent of one of the Hero Twins of the K'iche' epic, the Popol Vuh. Logically, this would be the male holding the bird, since Itzam Kokaaj is the supreme creator god of the ancient Maya who is seated appropriately on a raised platform. “Wa’k’” is an undeciphered term, which may refer to the bird or to the quantity of rabbits. In the scene Juun Ajaw seems to be saying that rabbits are a fine offering, but certainly not comparable to the rare and beautiful wa'k'-bird that he holds. The dwarf seated behind the throne seems to be in agreement, as his caption says in part, "Here, your payment is good, [really] good," as he raises his own offering of a small bird to the god. This caption is important, as it allows us to infer that the scene is actually one of tribute payment. We know from other images and texts—such as the murals of Bonampak—that historical rulers also expected tribute payments, usually in the form of cacao, feathers, fabric, and other goods. Interestingly, Maya artists working in multiple styles painted images related to the mythic episode shown on the LACMA vase. One example is now in the Princeton University Art Museum (2005-127). 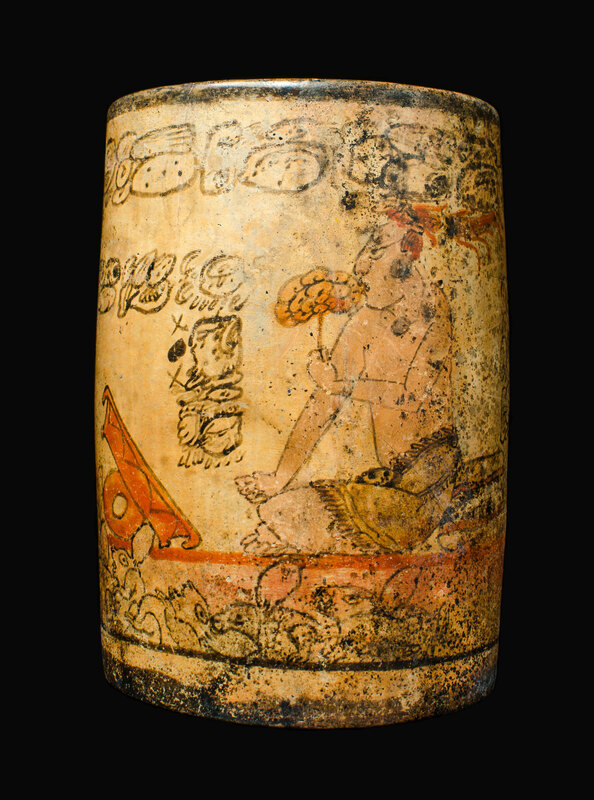 [Figure 3] This vessel, probably from the vicinity of Zapote Bobal or El Pajaral, in northwestern Peten, Guatemala, shows an aged Itzam Kokaaj seated on a jaguar cushion. As on the LACMA vessel, a dwarf offers birds to the god, and the caption in front of his face is the familiar comment, "'Here, your payment is good, [really] good', said Itzam Kokaaj." Juun Ajaw is again represented in the scene. He is the spotted figure to the far left on the rollout, who adjusts a stone atop the head of an already overloaded toad or reptile. This burden (ikaatz "cargo") may contain his personal tribute payment to Itzam Kokaaj. On yet another vessel, a stuccoed cylinder now in the de Young Museum (Fine Arts Museums of San Francisco, 2013.48.1) a dwarf again offers a bird to the supreme god, here in youthful form. [Figure 4] The first two blocks of the caption above are difficult to interpret; however, the remainder of the text reads, “..is good, said Itzam Kokaaj to ....” On the other side of the vessel, we see an aged avatar of Itzam Kokaaj, before whom is seated a gopher who offers him a beverage in a cup. The caption of this scene is only partly legible, stating: “pinole …said the gopher [to Itzam Kokaaj].” Pinole is a well-known Mesoamerican liquid concoction made from parched ground corn mixed with cacao and various flavorings. This image reveals yet another dimension of the myth, in which not only birds and rabbits are offered as tribute to the god, but also delicious beverages. Another vessel in a completely different style, Kerr 3413, again shows the gopher (on the upper platform, holding his little cup), together with virtual "Maya zoo" of mythical animals making payments of food to Itzam Kokaaj, who reclines on the uppermost level. [Figure 5] The human figures to the left are again the Hero Twins, recalling the LACMA vessel, but here dressed in jaguar skins and holding blowguns. A final vessel, Kerr 8076, is executed in yet another style, this time using an incising technique. It shows a dwarf standing before a reclining woman. [Figure 6] The inscription associated with this scene again mentions pinole, ch’aj, followed by three difficult blocks and then yalajiiy son, “said the dwarf”. The scene on the other side of the pot shows a coati seated before Itzam Kokaaj. The caption reads, “There is not much tribute, said the coati.” Thus, we see the dwarf making a comment about pinole as part of a mythic narrative that explicitly involves tribute assessment. Viewed in the context of this eclectic range of vessel scenes, it is apparent that the image in which rabbits are piled before Itzam Kokaaj on the LACMA vase is part of a mythic tale of tribute presentation. In this story, a dwarf, Juun Ajaw, or an animal offers pinole, birds, or rabbits to Itzam Kokaaj. Probably there is some negotiation over the quantity and quality of these offerings. 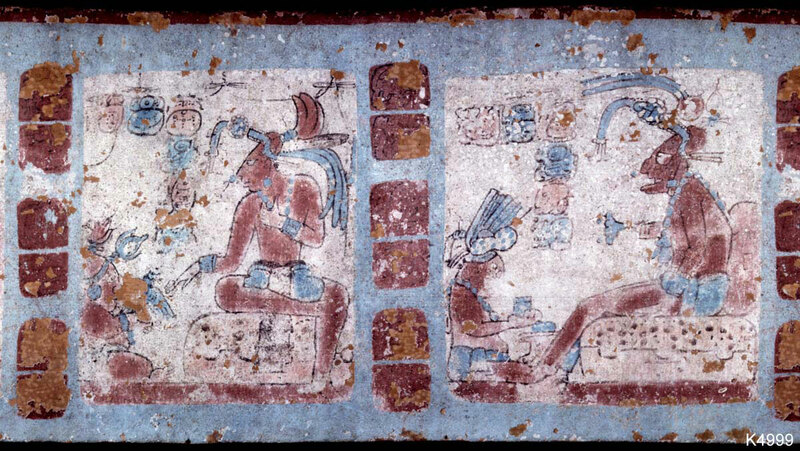 The varied styles of the vessels on which these scenes appear suggest that these stories were widespread, likely written down in books that were available to Maya ceramic artists. Differences in the characters and details expressed in the images and texts imply that there was significant variation in narratives from site to site. Without a doubt, the popularity of these scenes on courtly ceramics was tied to the importance of actual tribute rituals, which enhanced the wealth and prestige of ancient Maya courts. More specifically, the appearance of this imagery on numerous drinking vessels points to the mythic undercurrents of the consumption of cacao and other beverages by Maya elites. We might even speculate that these cups were given as gifts by rulers to subordinates in acknowledgment of having received tribute from them. Perhaps a modern analogy would be to receive a mug or similar object with a bank logo after opening a new account. Matthew Looper is Professor of Art History at California State University, Chico. At Chico State, he teaches a number of courses in non-Western art history, with a focus on ancient Mesoamerica and also heads the Maya Hieroglyphic Database Project. His most recently published book is an edited volume on early dress in ancient Mesoamerica and Central America. He is currently working on a book on hunting dances in the Maya area as well as a revised edition of the New Catalog of Maya Hieroglyphs. Yuriy Polyukhovych received his Ph.D. in History from the Taras Shevchenko National University of Kyiv in 2012. His dissertation was devoted to the analysis of Palenque and its region’s inscriptions including new, undocumented or poorly-studied texts. He is currently working as postdoctoral researcher in the Maya Hieroglyphic Database Project, Department of Art and Art History, University of California, Chico. Polyukhovych's research interests include Classic Maya art, decipherment and the use of hieroglyphic inscriptions in understanding Classic Maya political history, and historical linguistics.